For years, the warm waters surrounding Vancouver Island’s Mill Bay have been a popular destination for local salmon fishers. The inviting water and the 225-metre long sandy beach have also made nearby Bamberton Provincial Park an ideal spot for parents to bring their families. While the kids frolic in the warm waves, parents can lounge in the sand and enjoy the views across the inlet – to the east are the shores of the Saanich Peninsula, with the southern Gulf Islands and Mt. Baker beyond. Rising sharply to the west are the mountains of south Vancouver Island. Fronting on the west side of Saanich Inlet, of particular interest in this park is the abundance of arbutus trees, identified by its thick, leathery green leaves, reddish trunk and peeling bark. The arbutus is Canada’s only broadleaf evergreen and is found only on Vancouver Island and the lower coast of mainland British Columbia. A vehicle accessible campground is nestled in this forest environment, where eagles and osprey can be seen circling high above. Waterfowl and seals are frequent visitors to the surrounding waters. The park is very popular in the summer months, and can be busy as well in June, when a number of nearby schools make field trips to study the intertidal life on the beach. With Victoria just a 30-minute drive south over the scenic Malahat Drive, Bamberton is within easy reach of many tourist attractions. You can also hop on the Mill Bay ferry for the 25-minute trip to Brentwood Bay and visit the world-renowned Butchart Gardens. 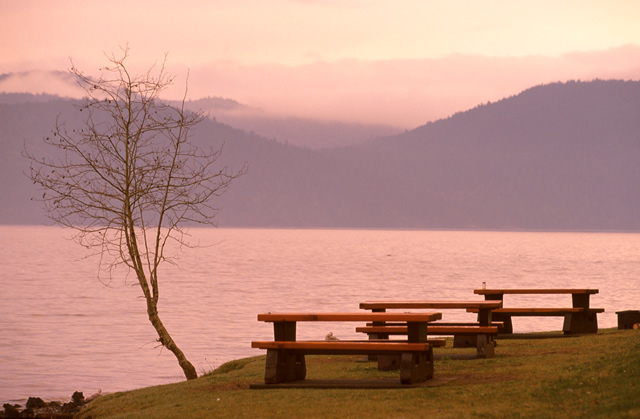 The park is located on southern Vancouver Island, approximately 45 km north of Victoria off Highway 1. Turn east off Highway 1 onto Mill Bay Road, near the north end of the scenic Malahat Drive. BC Ferries offers service from Mill Bay to Brentwood Bay, a distance of 8 km by sea with a crossing time of 25 minutes. Bamberton Park is located a 5-minute drive south of Mill Bay. Nearby communities include: Mill Bay, Shawnigan Lake, Cobble Hill, Duncan, Victoria. History: Bamberton Park was given to the province by the British Columbia Cement Company in 1959. The name Bamberton was chosen by the donors and commemorates H.K. Bamber, managing director of the British Portland Cement Manufacturing Company, a predecessor of the BC Cement Company, now known as Ocean Cement. Cultural Heritage: Traditionally, local First Nations used Johns Creek, which runs through the park, for trout fishing and still utilize the area today for ceremonial purposes in the fall and winter. Conservation: Bamberton protects a mixed woodland of second-growth Douglas fir and arbutus, a salmon-bearing creek and eel-grass beds in the estuary. Over time, natural weathering forces may return the creek outflow area to a floodplain with salt marsh communities. The park also features an interesting intertidal zone, popular with school groups who visit the park to study the marine life. In your observation of the intertidal zone, please remember to carefully place overturned rocks in their original position. Do not touch the marine life or remove any shells or marine organisms from the park. Canoes and kayaks may be used in the inlet. Paddlers can put in at the beach area. The sheltered inlet around Bamberton is a great paddling location, offering views of Mount Baker and the Saanich Peninsula. The warm waters surrounding Mill Bay are a popular destination for local fishers seeking a variety of salmon and rock fish. Fishing is permitted as per provincial and federal fishing regulations. All anglers should check the current regulations issued by Fisheries and Oceans Canada, prior to fishing. Anyone fishing or angling in British Columbia must have an appropriate licence. A 1.5 km trail connects the campground to the beach at the day-use area. This trail is steep in parts. The route from the day-use parking lot to the beach is wheelchair accessible and paved. For your own safety and preservation of the park, obey posted signs and keep to designated trails. Shortcutting trails destroy plant life and soil structure. There are interpretations services available at this park. Pets/domestic animals must be on a leash and under control at all times. From May 1 to September 15th, dogs are not allowed in the lower day-use area (beach and lawn area). You are responsible for their behaviour and must dispose of their excrement. Backcountry areas are not suitable for dogs or other pets due to wildlife issues and the potential for problems with bears. There is no designated swimming area at this park; however, the inviting warm water and the 225-metre long sandy beach at the day-use area provide excellent opportunities for ocean swimming. There are no lifeguards on duty at provincial parks. Cold water taps are located at the campground and day-use area. Taps are shut off during the off-season. There is a picnicking and day-use area available at this park with a large vehicle parking lot, picnic tables, flush toilets, fresh water and a large grassy area where children can be let loose to play. The day-use area provides easy access to the beach. Pit toilets are located at the campground and day-use area. Flush toilets can also be found at the day-use area and are accessible from April 1 to September 30. This park offers vehicle accessible campsites, nestled amongst a mixed woodland forest. Campsite reservations are accepted and first-come, first-served sites are also available. Bamberton Provincial Park is open year-round, with limited facilities in the off-season. The campground at Bamberton Park is wheelchair accessible. The route from the parking lot at the day use area to the beach is wheelchair accessible and paved; some portions are steep. Toilet facilities are also wheelchair accessible. Bamberton Provincial Park is open year-round, with limited facilities in the off-season.